Your children probably have a whole bedroom full of toy cars, trains, dolls, blocks, balls, dinosaurs, and games. 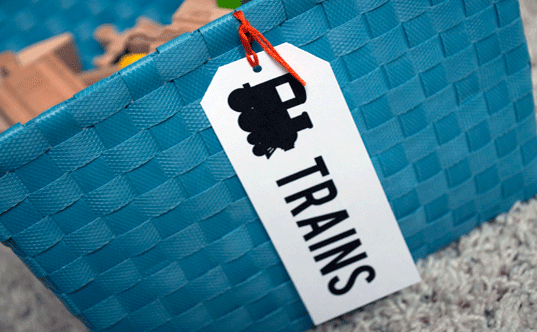 By organizing the toys into bins with tags that name and show a picture of what goes inside, you can teach your child how to keep their toys organized all on their own. We love the simple and straightforward DIY tags created by the stationery designer behind Lily Jane. This idea makes for easy clean up, and if you find the right bins, they will look fantastic when placed on a shelf, too. These tags from Lily Jane, can be printed using 100% recycled post consumer waste paper and soy based inks. I used these tags to organize my son’s closet using bins I found at our local thrift store. We used the bins to organize the toys, books and clothing that he will be growing into – on the top shelf of his closet. We used another set of upcycled bins to put on the bottom shelve of his bookcase to hold Legos, action figures, toy animals, games, art supplies, and all of the other toys he is currently interested in. 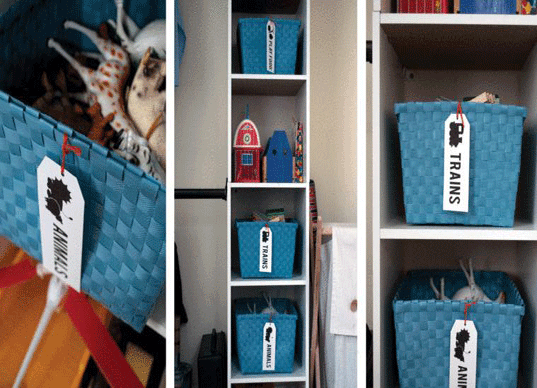 Brightly colored bins with toy tags is the perfect way to keep all of those little toys organized – giving you a beautiful looking room while allowing your child access to all of their toys that are hidden in plain site. And if you can find bins at your local thrift store, all the better for getting organized with little impact on the environment.